Congratulations to Davenports Tea Rooms of Bartington, Cheshire, on being named UK Top Tea Place 2013 by the Tea Guild of Great Britain. The tea rooms has speciality teas on offer, as well as classic afternoon tea menus and the occasional themed tea, such as the highly-popular Mad-Hatter's Tea Party. 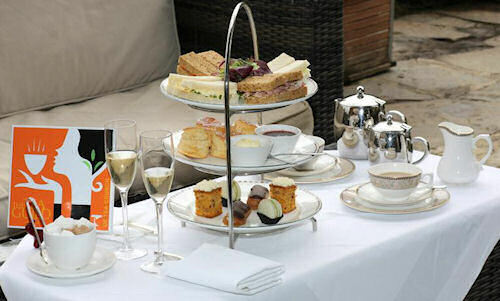 The Montagu Arms in the New Forest, Hampshire (Top City and Country Hotel Tea) and family-owned The Goring Hotel in London (London's Top Place for Afternoon Tea) were other notable winners and champions of the national drink. The Montagu Arms was commended for the "appropriateness of the crockery" (see photo above for evidence of appropriateness) and all-important "tea knowledge". The Goring is noted for its décor and provides an "excellent selection of carefully selected and perfectly brewed teas". Sorry, I disagree with the metal tea pot. Metal does no favours neither for the taste of a tea nor the temperature of the water. It is an affectation that no chap should accept as appropriate when entertain at tea.